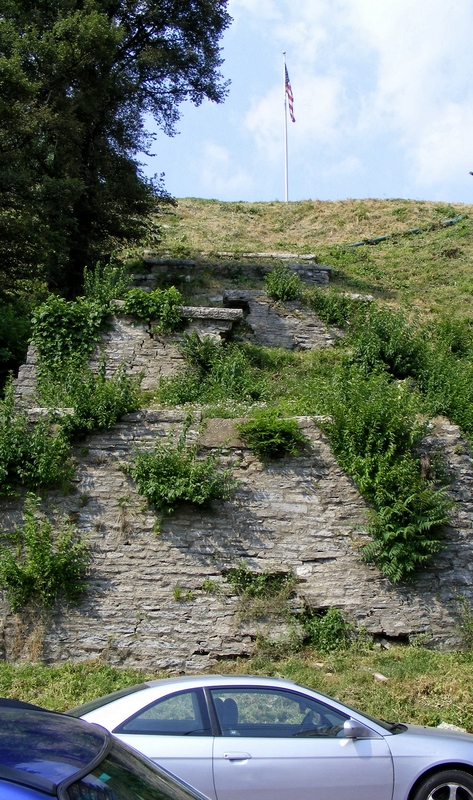 The Mount Adams Incline, once considered Cincinnati’s leading tourist attaction. The first passengers lined up at the foot of Lock Street in downtown Cincinnati just before 6 a.m. on the chilly morning of March 12, 1876, to buy their tickets for the maiden voyage of the Mount Adams Incline. Once the attendant opened the black iron gate, the riders rushed toward the railings of the platform mounted on rails like children at an amusement park. When everyone had stopped jockeying for position for the best view of the city and the Ohio River, the gate was closed. A series of bells – signals between the gate attendant at the bottom of the incline and the operator at the top – ensured that everyone was safely situated. The gate was closed and everything was ready to go. After a few seconds, the expectant passengers felt a jolt and the incline platform, or lift, began to slowly glide up from the sidewalk, as a matching lift on parallel rails at the top began its mirroring descent. As the distance between the ascending lift and the bottom waiting area increased, passengers looked over the side of the railing at the track below, which ended abruptly in a pit that was roughly 12 feet deep. The lift, which was flush with the street only a moment ago, was mounted on a base that was angled upon the steep rails so that the platform the passengers stood on remained level as it glided up the hill. Like a mountain goat with one leg longer than the other for climbing on uneven ground, the base of the lift appeared from the side to be shaped like an isosceles triangle. As the wall of the pit grew smaller from the ascending passengers’ point of view, a breeze lifted the hair of the women, and the eastern side of the city took on an appearance altogether different from the gritty, crowded streets the riders walked every day. Riders on the western end of the incline watched as the descending car slid down the hill toward them. Near the halfway point, over Oregon Street, the faces of the passengers on the other lift became distinct. For a few seconds, the parallel lifts were side by side, and the riders of the two cars studied the expressions of exhilaration on each other’s faces. Then, as quickly as they had come together, they drifted apart, the rising car now closer to the head house at the top of the nearly 1,000-foot-long track, the descending car slowing for its landing into the pit. The view today from Oregon Street of the remains of the Mount Adams Incline. The Mount Adams incline was the third of five inclines to operate in Cincinnati, beginning eight months after the one at Price Hill, and nearly four years after the Mount Auburn Incline, which began carrying passengers to the hilltop on May 12, 1872. For 70 years, until 1948, Cincinnatians depended on its inclines for transportation to and from the city to work, to shop and to play at one of the four resorts that stood at the crowns of Mount Adams, Mount Auburn, Clifton and Price Hill. The resorts – which offered dancing, fireworks, world-class orchestras, the best chefs and Cincinnati beer – had as their main attraction the breathtaking views of the city that the commoners had never before seen. The combination of the invigorating rush of a ride on an incline, followed by a night of dancing, drinking and fun was a form of entertainment that Cincinnati alone could call its own, and the city became known around the world as “The Paris of America.” The thrilling two-and-a-half minute ride, though, was possible only because of the sweat of the crewmen behind the scenes. The view from inside the head house at the top of the incline was very different from what the passengers saw. The pilot sat inside his glass-windowed cab, which was perched 10 feet above the head house floor at the edge of the hill where the track began. While he had the best view of the city, he was rarely able to enjoy it, as his job was to keep his eye on the lifts to ensure that the landings of both were smooth. He was a pilot in every sense of the word, as he had to “land” the two lifts simultaneously every three minutes. The lifts were counterbalanced; when one went up, the other came down. The pilot’s job was difficult. He had to balance the demands of meeting an unforgiving schedule with taking care of the passengers’ safety and comfort. Streetcars used the inclines to get from tracks at the bottom of the hill to the top, and if their schedules weren’t reliable because of delays on the inclines, the wrath of the public would be passed from the street railway managers to the incline managers, who would dress down the incline pilots. Furthermore, if, in his best efforts to keep the schedule, a pilot made a hard landing, he was given a tongue-lashing, especially if a passenger complained. The pilot and the engineer had the top paying jobs, but they earned every penny. Besides being the go-to person whenever there was a problem, the engineer stood for 12 hours a day. Ironically, the pilots were often held accountable for problems with the machinery while their job was to watch the lifts. This was due, in part, to a fatal accident on the Mount Auburn Incline years before. In October 1889, Charles Goble, the pilot, noticed that the brake was stiff. He reported the trouble to William Gunther, the engineer, who temporarily corrected the problem by oiling the machinery. Thinking that the problem had been resolved and fearing a reprimand if he shut down the incline long enough to investigate further while frustrated passengers waited, Goble continued operations as usual. Shortly after noon, the brake failed to work, and the ascending lift crashed full speed into the bumper at the top of the track, shattering the glass of the streetcar traveling on the platform. Nearly face-to-face with the frightened passengers, Goble stood with both feet on the brakes while the steam continued to turn the winding drums that propelled the lifts. “For God’s sake, let the people out!” Goble shouted. “The passengers all appeared to be standing up when I saw them,” he said. The attendants rushed to open the gates, but before they could the tension on the main cable and safety cable was too great and caused both to break. The lift hung in midair for a few seconds as the upward force gave way to gravity, and then began its unrestrained descent. Goble, unable to watch his passengers fall to a certain death, turned away and ran downstairs to the basement of the head house where the machinery was located, racing the clock in hopes that something could be done. “(S)eeing the steam still going through the engine I ordered that it be cut off at the boilers.” It was too late, though. Within seconds three passengers lay dead among the wreckage of the splintered car at the foot of Main Street, and five would die in the hospital. The Cincinnati Commercial Gazette fixed the blame on Goble. Three days later at the coroner’s inquest, Gunther testified on behalf of his fellow employee. “Mr. Goble complained two hours before the accident that the throttle worked stiff.” He told the assistant to oil the cut-off box and the bearings, “after which Goble said the throttle was working easier; after the accident I found Goble standing against a post crying.” Within a week, the coroner’s investigation revealed that an iron chip had become dislodged and held the steam valve open, but Goble never got over it, and the city never forgot. Owners of the next four inclines were understandably concerned about passenger safety and comfort, and tolerated no mistakes from their employees. In return, the men received minimum wages. In 1915, an oiler was paid $1.75 per day, which was low even by yesterday’s standards. The engineers and pilots got a day off each week, but the oilers, carpenters and handymen worked seven days per week, 365 days per year. Vacations, holidays and paid sick days were unheard of. Worker’s compensation was a thing of the future – in fact, when men were hurt on the job, it was likely that they were compensated adequately only if they brought a lawsuit against the company. Phil Lind, a railroad enthusiast and retired supervisor at the Cincinnati Metro transit authority, which evolved out of the Cincinnati Street Railway, says that it was not uncommon for the spouse of a fatally injured employee to accept an embarrassingly low sum for the negligent death of a husband, since there was no legal standard that applied to hazardous industries. It wasn’t until 1938 that worker’s compensation laws went into effect. Prior to that, it was every man for himself in professions such as the steel industry, meatpacking and the railroad. The inclines, which were essentially railroads, were dangerous places to work. Because of the owners’ desire to please the public, the inclines typically were not shut down during operating hours. The track workers had to concentrate on making repairs while at the same time avoiding two lifts that changed direction every few minutes. According to the Sept. 12, 1883, Cincinnati Enquirer, 62-year-old James Covalt was painting the Mount Adams Incline trestle with fellow employee Peter Brown about a hundred feet above the bottom station. The job required the men to crawl through an opening and get underneath the catwalk between the tracks. Around five o’clock in the afternoon, Covalt was either crawling in or out when he was hit by the ascending lift. When the power was shut off, horrified passengers looked on as his mangled body, which had been “carried along for several yards and cut to pieces,” was wrapped in a blanket, his head hacked from his mutilated corpse. News of Covalt’s death created little controversy in Cincinnati. Was Covalt being careless or was he simply doing what he’d been hired to do? We may never know. One thing is certain: His death generated little attention in 1883, and passengers continued to ride the Mount Adams Incline for 65 years. In 1947, when the city council decided not to bail out the financially troubled incline, the public threw a collective fit, and at least 40 letters were written to editors of the local newspapers. Cincinnatians of 1947 knew the value the Mount Adams Incline held for the city, which was listed in a July 31, 1947, Cincinnati Enquirer article as “the number one tourist attraction.” The details of the deaths of Covalt and two other incline workers have faded into distant memory. But their sacrifices and the blood, sweat and tears of the men of steel who made the inclines possible helped give Cincinnati the distinction of once being called “The Paris of America,” a reputation that will live forever in the city’s history.